The wax plant produces copious nectar. Be careful where you place your furniture! 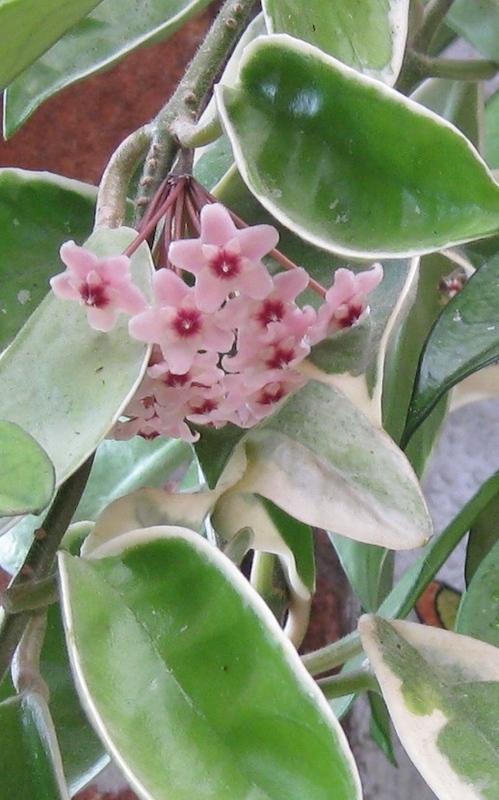 Years ago I had a healthy hoya hanging on the wall of a dark bathroom. It grew two new leaves each year but was healthy and conveniently small! In my previous home, my plant was in a 3” pot and, for fifteen years, it completely covered a south-east wall across from the window. It was magnificent with its dark glossy leaves, but it never flowered! Now, in our south-east facing conservatory, our rampant wax plant is already flowering a second time this year! This clearly is a plant that needs good light but not much compost. It is an epiphytic plant and does not have extensive roots. Do not believe the usual rubbish about giving a dribble of water in winter, and do not waste your money on a special feed! Yes, almost all house plants need to be drier in winter, but the advice should be water less often and allow the plant to become dry before you water again. A liquid feed once a month would be about right for my vigorous hoya but the small one in my old bathroom needed none. If you were to twist my arm, I would admit that rather than liquid feed, I top dress Brenda’s houseplants with a few granules of general fertilizer every three months. Clambering over our conservatory wall. Today, I counted 53 flowers! Gosh, you can see why it's called a wax plant! It looks positively artificial, until you notice the nectar. I also have one in my conservatory - not quite as prolific as yours! The grandchildren are endlessly fascinated by the flowers and always want to be lifted up to touch all the nectar dew drops! My record was 61 flower heads, but that was a few years ago! This year there are only 43! You obviously have the touch. Is it in a conservatory ? Did you propagate it yourself? Do you feed it? I only ask to pass on your secrets. Hi Roger. I really don't do anything special at all. In fact, I usually forget to feed and water! I do try to remember to give a liquid feed every month or so throughout spring and summer, but it usually ends up being only about 4 feeds a year! Like yours, it's in a SW facing conservatory. I've come to the conclusion that they thrive on neglect!